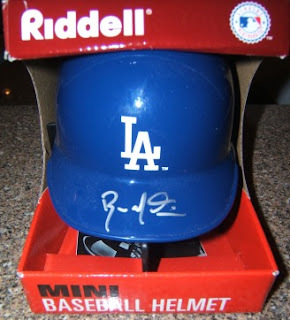 This Los Angeles Dodgers mini-helmet was signed in-person by Russell Martin, the New York Yankees All-Star catcher in 2007 - back when he was among a group of young Dodgers prospects that was part of the future, including Andre Ethier, Matt Kemp, James Loney, Andy LaRoche, Tony Abreu, et al. After enduring a rough couple years leading to his depature in L.A., it looks like Martin is having a bounce back season at the plate - he was one of three Yankees to hit a grand slam against the Oakland Athletics last Thursday in a 22-9 win. Detroit Tigers pitcher Justin Verlander is probably the best pitcher in Major League Baseball and will gain all sorts of postseason awards for his dominance on the mound in 2011 - however, this season isn't the time to be a front runner and jump on his bandwagon, particularly he wasn't too happy after Angels shortstop Erick Aybar tried to break up his no hitter in a 3-2 win against the Angels on July 31. 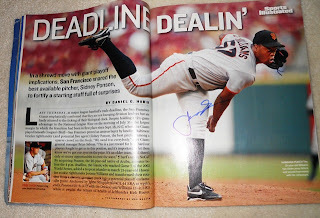 I got the officially licensed Photofile 8x10 photo signed in-person by Verlander back in April 2007 - his autograph isn't all that great, but at least I can say I ran into him and actually had something signed. I got this card by Florida Marlins outfielder Mike Stanton when the Marlins came and played the San Diego Padres in San Diego - this is one of the three cards I got signed [two by Marlins backup catcher Brett Hayes] during batting practice before security on the field told me not to throw my clipboard over the dugout. The trading card set of choice for me to get autographed are cards from the 2006-present Topps Allen and Ginter's sets - sometimes, I do like getting retro cards like Topps Heritage signed, though it is on a 'card-by-card' basis instead of an 'all-out' effort. I didn't have time to throw a Sharpie to Stanton - so he signed my card with the blue ballpoint pen he had signed a couple of baseballs with. 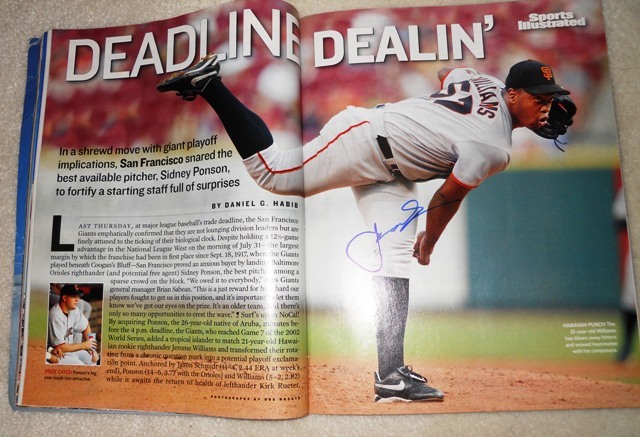 I got this Sports Illustrated page signed in-person by Jerome Williams when he still had some 'top prospect' status with the San Francisco Giants back in 2003 or 2004 - I had to dig it out when he picked up his first MLB win in five years for the Angels. By virtue of being a journeyman, he might not stick around too long with the Angels [or even in the Major Leagues] - but perhaps at 29, now possesses the knowledge and still has the stuff to make something of his opportunity. So Jered Weaver and the Angels have agreed to a contract paying him around $85 million for the next five seasons - with the way he has been pitching over the last few seasons, it is nice to see Angels general manager Tony Reagins get something done to lock him up for the long haul. A professional athlete in his prime, looking for that next long-term contract that is going to take his relative wealth to a whole new level is understandable - but sometimes the athlete doesn't experience the same level of success and despite being paid more than he has ever had before, alters the course of his professional career in a downward spiral. As a potential free agent, Weaver may have gotten a minimum of $120 million or more as a starting point - it maybe refreshing to assume he has had it good in Anaheim and didn't want to drastically change his lifestyle. It seems like Weaver has really built up an ardent fan base and while he may not come across as being having a superstar persona - he gets fans interested by his performances as the ace pitcher of the Angels staff. Hopefully Weaver is still a pitcher on the rise and the Angels investment will pay off - there have been pitchers [like Brandon Webb, Jake Peavy, Johan Santana] who have broken down and stumbled in their early 30s, after enjoying much success through their prime years like Weaver has had. My friend and stopped at a card shop I haven't been at in about two years and I spent $4.75 on 24 cards - what does someone think when I spend an hour lingering at their 'card shoppe' and spend just about $5 on random cards? I'm not a big box breaker or a guy who usually picks up various singles but there is a seemingly a higher premium for both at this shop - so there has never been a real incentive to make an impulsive purchase. However, there is a good selection of monster boxes [mainly sorted by year / brand] to dig through, including the '5 for $1' boxes featuring rookies / prospects - so maybe I could take home a little 'grab bag' of cards. I actually started with what looks to be a 3,200 box with a row of common baseball inserts - I want to look for various inserts just for the possibility there maybe some nice, if not particularly valuable keepers. 2.) 2009 Donruss Elite Extra Edition Jake Marisnick #39 - I have this 'draft pick' card already, but Marisnick has enjoyed a breakout year in the minors. 3.) 2009 Bowman Chrome Prospects Luis Jimenez #BCP 22 x2 - not a super prospect but someone who has steadily battled up the minor league ranks and may earn a September call-up. 4.) 2009 Bowman Prospects Michael Stutes #BP 62, 2009 Bowman Draft Gold D.J. Le Mahieu #BDPP27 and 2010 Bowman Platinum Trevor Plouffe #77 - random cards of three players who have been 2011 MLB rookies. 5.) 2011 Upper Deck World of Sports Stephen Fife #153 - he was traded to the Los Angeles Dodgers from the Boston Red Sox and this unlicensed card is another I maybe able to get signed, if he gets to the Major Leagues. 6.) 1988 Topps Traded Robin Ventura RC #124T - this card is probably worth a nickel these days, but sometimes the nostalgia of growing up as a baseball fan through the 1990s kicks in and Ventura was one of the better players at the time. 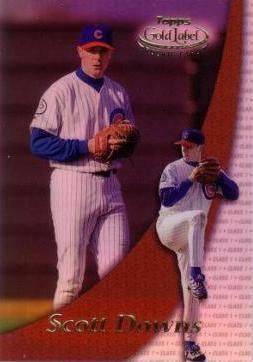 About 20 years ago, this card may have been known as an 'XRC' in a Beckett though various trading card designations in a price guide have faded away over time. 7.) 1989 Upper Deck Roberto Alomar #471 - I prefer this second year card of the Hall of Fame second baseman, over his various 'rookie issues' released in 1988, though it is probably worth a nickel like the Ventura card. 8.) 2006 Topps Allen and Ginter Josh Willingham #256, 2006 Topps Allen and Ginter Anderson Hernandez #263 and 2006 Topps Turkey Red Melky Cabrera #627 - random 'setters' I probably didn't have and probably wouldn't have bothered looking for unless I stumbled upon them. 9.) 1996 Fleer Update Tony Batista RC #U70, 1996 Fleer Flair Tony Batista RC #141 and 1996 Fleer Update Chris Singleton RC #209 - an old friend of mine 10-12 years ago used to hoard all sorts of cards and maybe I'd be a little jealous he would dig out these types of cards. I actually remember when these Batista [and his goofy stance] and Singleton [now an 'analyst' for ESPN] had their breakout seasons in the late 1990s-early 2000s and just maybe their rookie cards were something to chase for maybe half a season or so. 10.) 2009 Bowman Prospects Wilin Rosario #BP 58 and 2009 Bowman Chrome Prospects Maikel Cleto #BCP 155 - a couple of prospects working their way through the minors. This isn't another in-person autograph failure like what happened with Dodgers' ace pitcher Clayton Kershaw - but probably a story about getting a couple of autographs at a public appearance that turned out not to be one of my better in-person autograph experiences. Rising Angel star Mark Trumbo did a signing at a Dave and Buster's restaurant in Orange, California a couple of weeks ago - I think I waited about five hours to get through the line from when I got there and since there were a couple of signings going on, it wasn't too congested. I was really hoping I'd get a nicer autograph as Trumbo has done a bunch of signings in 2011 - perhaps he has had some opportunity to 'refine' his penmanship. I finally was able to approach him on stage to get my 8x10 print signed and perhaps his autograph would have been fine - if I'd just let him sign the white border that I still needed to cut off the print, but I tried telling him to sign it "big" and across the image. He ends up signing my 8x10 print to the side and the autograph is literally 'MT 44' and it wasn't like I expected a 'letter for letter' autograph - but I felt like he didn't want to deal with me and gave me a chicken scratch autograph on purpose. More awkwardness ensues when I get back in line for a second autograph - I overhead a conversation Trumbo and the Angels handler were having about rubbing down the 2011 Bowman cards people having them signed because they were too glossy. The handler then grabs my 2011 Bowman gold parallel, rubs it against his shirt furtively and accidently drops it - as Trumbo grabs for my card, he says something like, "back again, two for today huh..."
The Angels handler mumbles something towards me, but Trumbo does sign another 'MT' autograph on my card - as I thank him and walk away he responds, "yeah, I'll see that on eBay." As he said that, I wanted to go crawl under a rock somewhere - I kept thinking I probably should have started up at one of the other Angels signings that morning. 2011 Topps Lineage value pack [$4.99 each at a Target] - all I can say is busting a lone value pack isn't as much fun as ripping through a blaster of Lineage. 2011 Bowman Platinum value pack [$8.99 each at a Target] - I was looking for a cardboard fix, so I tried another 2011 Bowman Platinum value pack. 2011 Topps Lineage blaster box [$19.99 at a Target] - I've been curious about this product and with all sorts of hobby breaks that have trickled out at a couple of the sports card forums I visit [Freedom Card Board and at Blowout Cards], I was hoping to see the retail versions of this new Topps product out on the shelves. I kind of want to bust a a full hobby box of 2011 Topps Lineage - but the good chance I might pull a Jason Motte, Fernando Rodney or David DeJesus autograph card as one of my hits from a $90 box terrifies me. The bonus hit in the blaster boxes sweetens things up a little bit - though GU / memorabilia / relic cards are not quite the hits people are looking for these days. I ended up pulling a Clayton Kershaw mini 1975 Topps relic - using an 'old-school' Topps design adds some novelty to what would probably a common pull otherwise. The relic card is in a cello wrapper by itself - as opposed to being inserted in one of the packs. #NNO Derek Jeter - 3D insert; were the Angels really going to have a ceremony to honor Jeter for some reason or another? #135 Tim Lincecum - 1975 Topps mini parallel / wish Topps would have replicated the 'original backs' and also perhaps made these parallels on Heritage style cardboard. #190 Bert Blyleven - maybe I would have preferred stats instead of a blurb on the back of these cards, though I like the backgrounds seemingly color coded by team. #196 Ichiro - part of the Topps All-Rookie subset? #195 Chipper Jones - part of the Topps All-Rookie subset? I got Bert Blyleven to sign his 1971 Topps rookie card before the Minnesota Twins / Angels game in Anaheim last Tuesday afternoon - he took the time for nearly everyone who wanted his autograph the first day of the three game series, but was a little more elusive the following days. I think he signed all baseballs on the side panel - including specialty Hall of Fame baseballs. Character actor David Koechner was wandering outside infront of Angel Stadium after a game a couple of months ago - someone had walked up to him wondering who he was and Koechner was sort of giving him clues to try and help figure out. He was then taking pictures and signing autographs - while not quite an 'A-List' celebrity, Koechner seemed really friendly when approached. I'd gotten former Angel Ron Jackson's autograph at least once or twice when he was a coach for the Boston Red Sox through the mid 2000s - but I had a couple of Angels cards ready when he threw out the first pitch before an Angels game last Thursday night. I ended up getting a 1984 Topps card signed during the game - I like the 'Papa Jack' inscription and while he seemed a little distracted [he was talking with what seemed to be a good acquaintance], it seemed like he was a happy mood to sign autographs. Minnesota Twins bullpen coach Rick Stelmaszek played for the Angels for part of a season in 1973 - he is among the obscure MLB players to pass through and play for the franchise, collecting 4 hits in 26 at-bats in 22 games as a catcher. While I didn't have an actual card of his to sign, when the Twins played the Angels last week, I got him to sign a 2010 Topps Heritage Minnesota Twins team card - so I can add him to my Angels autograph collection.